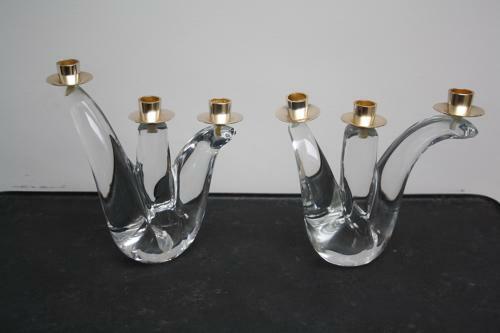 Hand blown crystal glass candlesticks in naturalistic style with gilt metal drip pans by French glass company Schneider Glass. Etched signature to base. Schneider glass was founded in 1917 by two brothers who previously worked for Daum glass. The company sadly closed and ceased production in 1981. Both candle holders are in great condition with no scratches or chips.